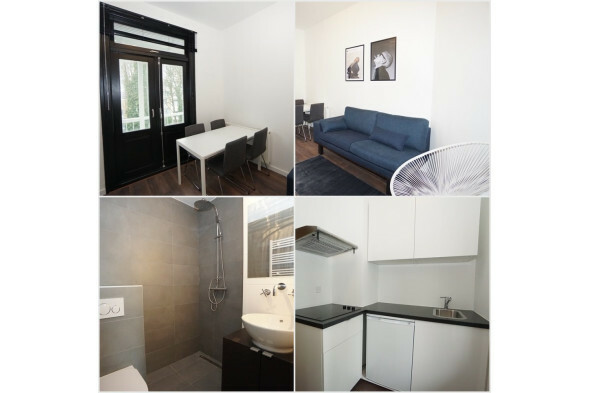 Within walking distance of Rotterdam Center a furnished studio on the 1st floor. Close to the pleasant shopping center and public transport is easily accessible. Within walking distance of Rotterdam Central. Entrance of the studio on the 1st floor. The studio is decorated in Urbanstyle and includes a two-seater sofa and is located at the front. The open kitchen corner unit is equipped with all conveniences such as electric cooker, fridge and breakfast bar. The sleeping area is equipped with a double bed and wardrobe. The modern bathroom in bright colors is equipped with a walk-in shower, washbasin with mirror, design radiator and toilet. The bathroom is shared with 1 other occupant.